Haze lovers rejoice! One of the most famous Haze strains is now available in an easy to manage, autoflowering package. Amnesia Haze Autoflowering is a mix of Amnesia Haze x Ruderalis and takes 10-11 weeks to go from seed to harvest. Amnesia Haze Auto is a strong sativa-dominant hybrid, the result of crossing the mighty Amnesia Haze with an autoflowering ruderalis strain. With genetics hailing from Jamaican and South Asian landrace strains, Amnesia Haze Auto has the rounded-out, full-bodied temperament of a hybrid, while maintaining a strong connection with its sativa Haze lineage. The combination that balances everything out here: 70% sativa, 20% indica, 10% ruderalis. By keeping the indica variety in the line (instead of breeding a pure sativa), Amnesia Haze Auto retains some of the relaxing effects and generally keeps from getting too anxious or edgy-feeling. Winner of multiple international prizes at cup tournaments the world over, Amnesia Haze Auto has earned its place at the table (and in your bowl). 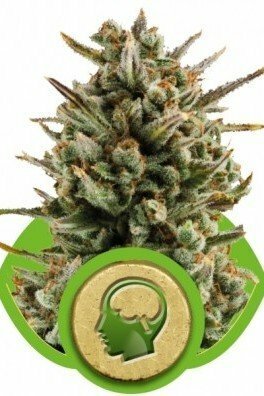 Amnesia Haze Auto is the sativa lover’s favorite, producing potent buds with that signature Haze high, after just a short flowering period of 10-11 weeks. It sports all the benefits of a legendary strain, but with the added hardiness of robust autoflowering genes. Autoflowering strains will automatically flower as soon as they are old enough to, as opposed to other strains that depend on delicate indicators, most notably the changes in lighting hours. Indoor grows will produce plants 60-100cm in height, yielding 350-400g/m². Outdoor plants typically grow a little taller at 100-140cm, while yielding 30-160g/plant. The flavor and aroma profile of Amnesia Haze Auto is filled with earthy lemons and citrus. Along with an average 17% THC and medium CBD, the terpene profile is bright and uplifting - all of it synchronizing to give an energetic, euphoric buzz. Some have noted this strain giving nearly psychedelic effects, with a soaring cerebral and intense sativa high. Growers who maximize THC levels can enhance this aspect if they wish. This strain will leave a goofy smile on your face, melting away your troubles and leaving your glass half-full. Medical patients have found Amnesia Haze useful for finding relief from stress, fatigue, and depression, due to its relaxing and mood-boosting effects. This strain is perfect for use throughout the day, and pairs especially well with outdoor activities like dog walking, kite flying, or even lawn mowing.